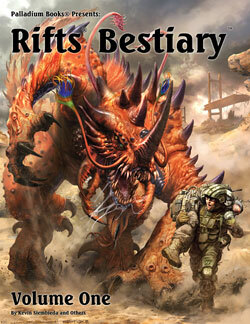 The Rifts® Bestiary™ Vol. One Megaverse® Insider Offer is off to a great start. 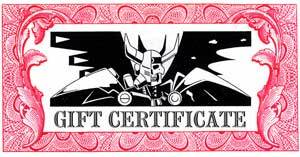 The Ultimate Benefactor offer sold within hours of going live (thank you! ), and we have sold most (only 5 left) of the Benefactor offers in which your name becomes an unstatted character in the book itself. This particular bundle is limited to only a dozen, unless Charles “Chuck” Walton manages to find a few other concept drawings to expand this category (which wouldn’t be more than another 3-5, I think). Of course, the two limited edition hardcovers and the PDF are the other hot items, but we are seeing interest in most of the categories, including Inside Help (thanks!). Our heartfelt appreciation to everyone supporting this fun and unique offer. 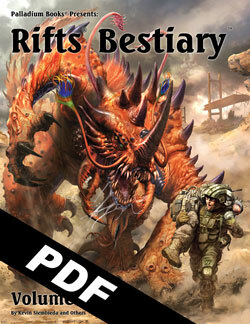 And because we are well into the final production of Rifts® Bestiary™ Vol. One, it should ship not too long after the Megaverse Insider Offer ends. Not months and months or a year later; we’re hoping end of April. If you haven’t taken a look at this offer yet, please do. Time is running out, with a little more than a week left to order yours. More details below. As usual, a lot is going on. I finished approvals for the text and all the artwork for the next three Rifts® for Savage Worlds books coming from Pinnacle. They are pretty darn awesome. Some of the best writing I’ve seen and a consistent high quality of artwork. It is nice when you work with a licensee that cares about the I.P. (Intellectual Property) and is good to work with. All three of the new titles are set in North America, and Pinnacle will be launching their Kickstarter for them mid-April. I will keep you posted. Due to popular demand, Palladium is bringing back Rifts® baseball caps. There will be three types of new Rifts® baseball caps – 1) screen printed red Rifts® logo printed on a black cap ($11.99), 2) premium embroidered baseball cap – black cap with red Rifts® logo ($21.99), and 3) a navy blue cap with white embroidered Rifts® logo ($21.99). We’re trying a new supplier, so we are as anxious to see the quality as you are. We are also going to be offering a different style of coffee mug (16 ounce, probably $10.99 each) that we think looks pretty sweet. We’ll be offering a Rifts® mug with the full logo (the classic Kevin Long art and Rifts® logo), a Property of the Coalition States™ mug, and a Fantasy mug (classic FRPG dragon); each has the image on both sides of the mug. We’ll announce them all when they are back from the printer and in stock, probably the end of April. 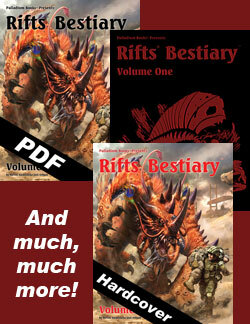 Otherwise I have been working away on books, primarily Rifts® Bestiary™ Vol. 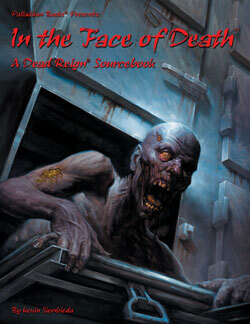 One, but also bits and pieces for In the Face of Death™ for Dead Reign®, and a few other projects. Plus plotting convention season, promotion, etc. We are still working on the Digital Palladium Fantasy RPG® Character Sheets. Will let you know when they go live. As I mentioned last Update, you can find MORE excellent video interviews with Palladium writers and artists like Charles Walton II, Carl Gleba, Brandon Aten, Carmen Bellaire, Apollo Okamura, Amy L. Ashbaugh and others – go to Questwise. And you can catch a great interview with me, Sean Patrick Fannon (Rifts® Savage Worlds), Cameron Cleveland (G.M. Supreme), and the host after Episode 19 on at https://voiceofhopepodcast.podbean.com and on iTunes. 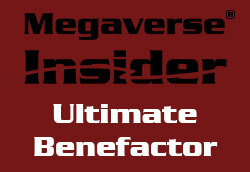 What is a Megaverse® Insider Offer? Besides fun and unique opportunities rarely available to the average gamer, the Rifts® Bestiary Megaverse® Insider< gives you the chance to get one or more of the following, depending on which item or bundle(s) you purchase. But do it fast because you only have a little more than ONE week before this deal ends. Note: Please read the full store description or the March 22 Weekly Update for complete details and to avoid any possible misunderstanding. 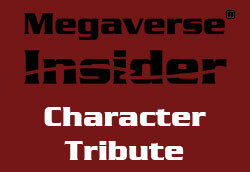 We know many of you are probably new to the Megaverse Insider Offer and we do not want you to miss out. Offer ends April 8, 2019, and some bundles are limited to just one or a dozen. It’s just a little more than ONE WEEK before this deal ends, and some items are very limited. You do not want to miss this offer. Many items, like the two hardcover editions, should become instant collectibles worth more than what you paid for them. Why? Because if our Megaverse Insiders only purchase 220 copies, or 50 copies, then that (plus a few dozen for staff, friends and special promotions) is ALL we are printing. There are no more to be printed. Not ever. This is it. ONLY those of you Insiders who buy one or two (plus the few dozen extra for Palladium’s own use) have a copy of that super-rare, super-limited, exclusive hardcover! That makes you a true “insider” and the item special and rare. Since this is the only print run and there are so few printed, the resale market value should be instantly more than what you paid for it. The Palladium RPG® Crimson Hardcover and the original Rifts® Gold Hardcover sell for $300-$600 on the collectors’ market, and they had press runs of 500 and 600 copies, respectively. 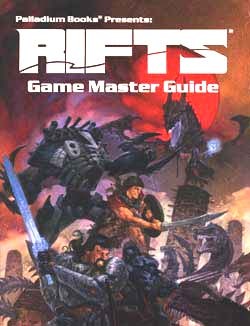 (FYI: The Rifts® Ultimate Gold Edition had a press run of 1,500 copies and it still regularly commands three and four times the original selling price.) Note: We may also do a limited Gold Edition available to the public, separate from the two super-limited hardcovers in this Insider offer, or not. Haven’t decided yet. LIMITED TIME OFFER: ALL of these items are only available during the short ONE WEEK or so remaining. Most will NEVER BE OFFERED AGAIN. THIS IS YOUR ONLY CHANCE TO GET MANY OF THEM. Offer ends April 8, 2018. And a few bundles are limited. See palladiumbooks.com for complete details. 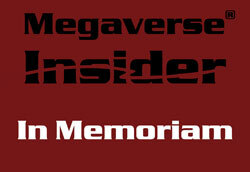 ORDERING the Megaverse® Insider – The Megaverse® Insider is hosted on palladiumbooks.com from now thru April 8. You make advance purchases of the select Megaverse® Insider offers exactly the same way you would place any online order for a game or sourcebook from the Palladium Books store. 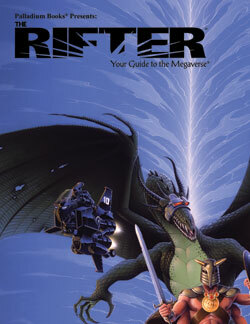 Each item has its own catalog number, price and page at the Palladium Books online store. Note: Some higher tier items are limited in number, we hope you understand. For telephone orders, call 734-721-2903 (order line only). You can order as many different items as you’d like, and you can place multiple orders for the same item, with only two exceptions. One last thing, please spread the word to your gaming friends and collectors, and post about it online wherever you can think of. We are only advertising this to YOU – our Palladium fans and insiders – and the offer is for a very short time: Now thru April 8, 2019. 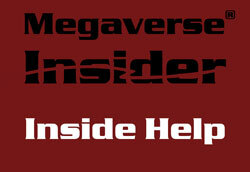 Become a Megaverse® Insider. This is the first big “Monster Book” reference ever done for Rifts®. Rifts® Bestiary™ Volume One collects nearly 100 animals, and offers more than a dozen new beasts found across North America. Presented in alphabetical order with the first third or half appearing in the 224-256 page Volume One, and the rest appearing in Volume Two. Actually, we may need a Volume Three because there are so many monsters and exotic animals in Rifts North America alone! Each is highly detailed and expanded, offering adventure ideas, and accompanied with a map that shows were they can be encountered, at a glance. 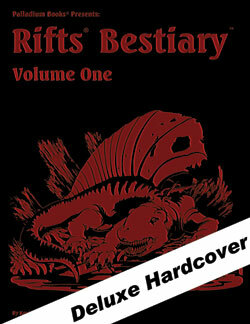 Rifts® Bestiary™ Volume One is nearing completion. There are only the last couple dozen creatures requiring updating and final writing, the finishing of the maps for each, then layout and printing. As soon as it arrives back from the printer, we ship it to you! All upcoming Rifts® Bestiary™ books will be great resources for players and G.M.s alike, with creatures that can be used as familiars, pets, riding animals, guard animals, and in some cases, even unlikely allies. Others are slobbering monsters or ravenous predators who include humans and D-Bees among their prey. All will give you plenty of spice to add to your characters and adventures. And each has a map that shows at a glance exactly where to find these beasts. Monsters and animals of Rifts North America organized into two (maybe three) big, easy to use sourcebooks. Easily adapted to any Palladium setting; basic S.D.C. stats included for each creature description. 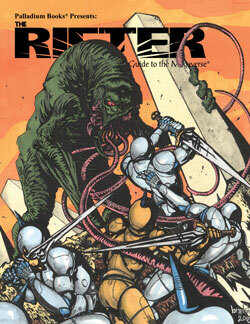 Fully illustrated, with art by Charles Walton II, Ramon Perez, Siembieda and many others. Written by Kevin Siembieda. 224-256 pages each volume – $26.99 retail – Cat. No. 896 (Volume One) – in final production. April release (tentative). I’m lining up artists for this title. I approved a few new sketches and extended the art deadline a couple of weeks. Most of the art for this book is done, and the rest is coming in a few weeks. Just in time for me to dive back into the writing. Still shooting to make In the Face of Death™ a spring release. I’ve got Mark Dudley working on some interior art and lining up other artists to get busy on Titan Robotics™ for a summer release. Waiting to see John Zeleznik’s concept sketches for the cover. The Raw Preview Edition gives you a great idea of what you can expect when the finished book is released later this summer. Some art is done and I’m lining up others. Garden of the Gods™ is going to be unique and fun. The Raw Preview Edition gives you a great idea of what you can expect when the finished book is released later this summer. We cannot wait to get all these books into your hands. I know Carmen is pretty pumped up about his contributions to the book, though I suspect he’ll need a bit more time finishing writing it. 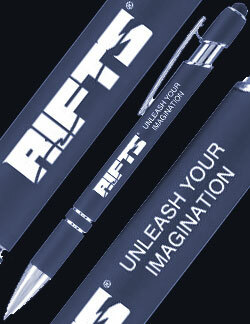 Rifts® Antarctica™ is going to surprise and delight a lot of people. Far from forgotten. Material is being selected for The Rifter® #83 now. We are anxious to put as many of the books you've been waiting for into your hands over the next 18 months, as we can. That includes The Rifter® #83 and #84, Rifts® The Disavowed, Rifts® CS Arsenal, Living Nowhere, the Beyond the Supernatural™ sourcebooks, more Fantasy sourcebooks and more. So if a book you are waiting for is not mentioned in an Update, it means there is nothing new to report, but it should still be in the pipeline and news for it will be coming in the weeks or months ahead. Right now, we are focused on releases for the next six months, which by our count is 6-7 titles. We continue to prep a number of new PDF releases for DriveThruRPG, including the three Rifts® Novels, The Rifter® #80, more Paper Minis, a few free things, and maybe a few surprises, so keep your eyes peeled. Recent PDF additions include The Rifter® #79: gaming through history, the Kingdom of Rifts® New Oslo®, a Rifts® short story, the Heroes Unlimited™ Stage Magician, tips on running a campaign, and more. The Rifter® #78 with the Modern Necromancer for use with Nightbane® and other settings, the City of Khemennu Part 2 for Palladium Fantasy®, the Nexus Zone for Rifts®, the aftermath of I Am Legion for Splicers® and more. Rifts® Heroes of Humanity™, the Coalition's response to the escalating Minion War™ crisis, uniting D-Bees, mages and heroes of every stripe to stand against this Demon Plague. CS psychics and Psi-Battalion, CS Demon Hunter, new CS power armor, cyborgs, gear, special training and more. Dead Reign® Paper Miniatures Volume Three: Zombies, Dead Reign® Paper Miniatures Volume Two: Civilians and Dead Reign® Paper Miniatures Volume One: Survivors. There are also paper miniatures for Heroes Unlimited™, Palladium Fantasy® and Rifts®. 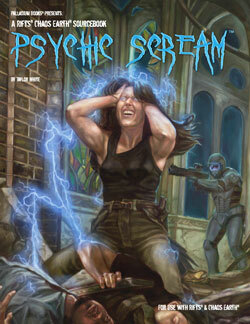 A new, up-to-date, PDF Palladium Books Catalog. Nightbane® Dark Designs™ sourcebook with 60 new Common Talents, 38 new Elite Talents, 18 new Morphus Tables, all other Morphus Tables collected and more. Systems Failure™ RPG, a 160 page RPG that deals with alien invasion and a post-apocalypse setting that is fun and dynamic. Civilization is on the verge of collapse when the so-called "bugs" invade and turn humans into zombie-like slaves. Monsters, heroes and fun. A complete RPG and setting. 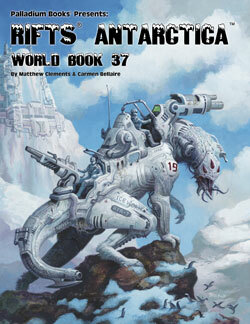 Rifts® World Book 34: Northern Gun™ Two: 256 pages of technology and fun. 30+ power armors, 30+ body armors, 15 combat vehicles, 45 vehicles (hovercycles, etc. ), 10 robot haulers, the Robodome and more. Bizantium and the Northern Islands™: the northernmost part of the Known World, the Cold Born, Necromancy ships made from dead sea serpents, 15 creatures, Random Sea Monster Generator, and more. Rifts® Northern Gun™ One. This fan favorite might be thought of as the big book of giant robots – an in-depth look at Northern Gun, 70+ weapons, 27 robots, NG O.C.C.s, key people and places, and much more. Mysteries of Magic™ Book One: The Heart of Magic™ with Wizards, their Apprentices, nearly 60 new magic spells and remember, magic and monsters in the Fantasy RPG are easily adapted to Rifts®, Chaos Earth®, HU2 and other settings. Wolfen Empire™ Fantasy sourcebook, the Great Northern Wilderness and Killer Winters, 12 Wolfen Tribes, Wolfen military and society, 15+ creatures, 5 full adventures, 101 adventure ideas, random encounter tables, notable people, places, plus FREE Sneak Previews of The Rifter® #80, The Rifter® #81, The Rifter® #82, and more on DriveThruRPG.com. Rifts® is a genre-bending setting that combines science fiction, fantasy, horror, post-apocalypse survival, magic, and endless possibilities for adventure. Imagine a near perfect world of advanced technology 100 years in the future. Then imagine that world crashing down overnight in an apocalyptic upheaval not seen since the formation of the planet. A Great Cataclysm caused by the explosive return of magic. Now fast forward 300 years into the future where magic, dragons, and mythic gods coexist with cyborgs, giant robots and super-science rediscovered from humanity's Golden Age as humans rise from a lengthy Dark Age. But they must contend with countless alien life forms, monsters, and supernatural horrors from beyond the Rifts. 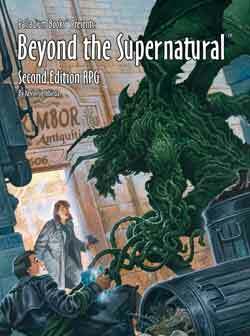 Beyond the Supernatural™ RPG, 2nd Edition: The complete, revised core game, 14 character classes and 42 occupations for "ordinary people," 100+ psychic abilities, 16 monsters, the Lazlo Agency, world setting and rules. My eBay store is one of the few places where you can find original artwork by Charles "Chuck" Walton, Kevin Long, and others, as well as one-of-a-kind negatives from classic Rifts® and other Palladium RPG books (they look awesome framed! ), rare Palladium collector hardcovers, signed books, other Palladium memorabilia, toys from my personal collection and other collectibles. Check every couple of weeks because we often post new stuff or offer a new sale. There is a sale on negatives starting today, in fact. Other one-of-a-kind original artwork available by me (Kevin Siembieda), Kevin Long, Charles Walton II (money goes to the artist), other artists, as well as collectible negatives, prints, limited edition hardcovers, proofreader copies, out of print items, Star Wars toys, Marvel toys and many other toys and collectibles from my personal collection. Alex and I will keep adding items as our busy schedules allow, but we have a lot of fun collectibles available now and coming soon. Hundreds of items. Take a look every weekend for new additions. Available now: One-of-a-kind book negatives. Negatives were very popular items at the Palladium Open House and people went crazy over them at Gen Con – including actor Joe Manganiello who scooped up a pile of TMNT negatives, while Palladium's own Mark Oberle, Carmen Bellaire, Brandon Aten and a whole lot of Palladium gamers went for negatives from Rifts® New West, Lone Star and Free Quebec. Fun. Negatives are unique and attractive, one-of-a-kind (on rare occasions two-of-a-kind if a page was replaced or a second edition was made) works of art that resemble woodcut art and are very dynamic conversation pieces. Before digital printing, pages of a book were laid out by hand on a board, and each page was photographed. The plastic film negatives were then "ganged" on a massive sheet of Mylar 16 pages per big sheet, and the printing plates were made from the negatives – everything white, printing black. And possibly a few others. This event is coming in April or May 2021, so start planning and saving for it. We’ll be looking into securing hotel dates and posting information in a few months. This will be Palladium’s 40th Anniversary, so we are looking to pull out all the stops to make it extra amazing. As usual, we’ll be looking for Game Masters to run events at the POH. We have a lot of projects in motion. In addition to numerous books, there is the upcoming digital Palladium Fantasy Character Sheets created by Prysus, the Rifts® iOS stickers for Apple devices (available now), three new Rifts® for Savage Worlds titles coming from Pinnacle Entertainment (set in North America, making the Rifts® Bestiary Vol. One and Two a perfect companion), Rifts® LitRPG novels coming this summer or fall, some speciality items and all kinds of good stuff. Do I even dare mention some of the other behind the scenes projects yet? Ummm, no. Let us get a bunch of the titles you are waiting for into your hands first. 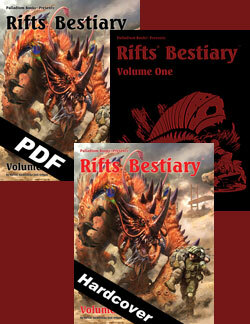 Alright, I need to get back to work on Rifts® Bestiary Vol. One. Enjoy the Megaverse® Insider offer, please spread the word about it as time is running out and keep those amazing imaginations burning bright. It is back from the printer, looks great, and is shipping now. 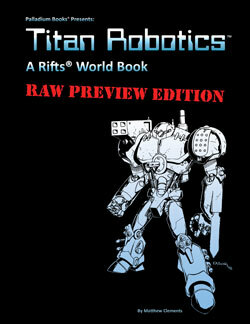 The "Raw Preview Edition" of Rifts® Titan Robotics™ is an advance copy of the unedited, unillustrated, working manuscript of a new Rifts® sourcebook coming later this year. You get to see the unfinished book months before the final title is released. A rare look at the raw manuscript before final edit, rewrites and publication. Limited to a total of 150 copies. Rifts® Titan Robotics™ is one of Palladium’s secret projects and something of a companion to Rifts® Northern Gun™ One and Two. It contains information about Titan Robotics, ARCHIE Three, how the company operates, its secrets, its plans, and a selection of new robot vehicles, power armor, body armor, weapons, gear, and dozens and dozens of adventure hooks and ideas. Note: The finished book is anticipated to ship in the summer or fall 2019, but you can see what it’s all about right now and even start playing with this special Preview Edition! Limited collector’s edition – only 150 total copies. 112 pages – Limited Edition – $20.99 – Cat. No. 899-RAW. The Raw Edition is shipping now. Do not miss out. It is back from the printer, looks great, and is shipping now. 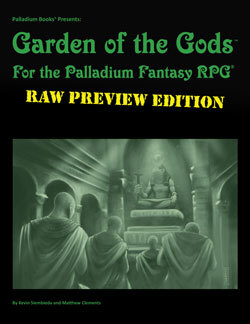 The "Raw Preview Edition" of Garden of the Gods™, for Palladium Fantasy RPG®, is an advance copy of the unedited, unillustrated, working manuscript for this new Fantasy sourcebook. You get to see the unfinished book months before the final title is released. A rare look at the raw manuscript before final edit, rewrites and publication. Limited to a total of 150 copies. This epic sourcebook presents the mysterious Garden of the Gods, a place of quiet miracles and wonders, its guardians, its many secrets, its many dozens of statues of unknown and forgotten gods, visions, omens, and the blessings available at the garden. As well as lurking darkness, the ominous Black Pit, and countless adventure hooks and ideas. The perfect prelude to the upcoming Lopan Fantasy World Book. Note: The finished book is anticipated to ship in the summer of 2019, but you can see what it’s all about right now and even start playing with this special Preview Edition! 96 pages – Limited Edition – $20.99 – Cat. No. 475-RAW. The Raw Edition is shipping right now. Do not miss out. 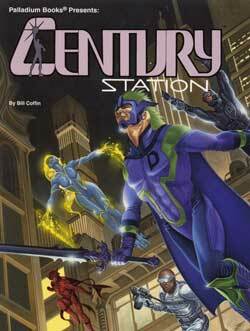 A setting sourcebook that presents the city of Century Station™, a hub for super beings, heroes, villains and trouble. It is jam-packed with near equal parts superhuman heroes and sinister villains suitable for any Heroes Unlimited™ campaign. 51 dangerous and powerful villains. 40 superhuman heroes and protectors. Information about Century Station law enforcement and SWAT. Super-Groups like S.H.O.C.K., Skywatch, Chimera, The Sector, plus criminal gangs, ninjas, the Triad, anti-alien groups and others. 101 adventure ideas, maps, weapons, gear, and more. Written by Bill Coffin, tons of great artwork. 224 pages – $26.99 – Cat. No. 517 – available now. The Rifter® #82 is all about discovery and unleashing the power inside of you. That's true whether you are playing a Chaos Earth® Pyromancer™ learning to survive and save lives after the Great Cataclysm; or a newly awakened Nightbane® seeking his or her purpose in a dark world of conspiracy and demons; or a Heroes Unlimited™ vigilante trained to the height of physical perfection in a war against evil; or an RPG gamer like you and me, unleashing our imaginations to create wonderful new characters and epic adventures. This issue of The Rifter® also lovingly celebrates a master of unleashed imagination and big thinking, Erick Wujcik, ten years after his untimely passing. Bits of Palladium history and heartfelt sentiments revealed along the way. Enjoy. Rifts® Chaos Earth® – Pyromancy, Nebraska Part Three – by Daniel Frederick, Matthew Clements & Kevin Siembieda. 50+ Pyromancy spells, the Pyromancer O.C.C., Zone Twisters, notable characters, and more. "Official" source material. 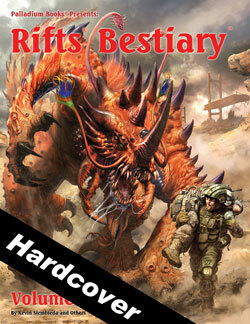 Rifts® Bestiary Sneak Preview – by Kevin Siembieda and Charles Walton II. 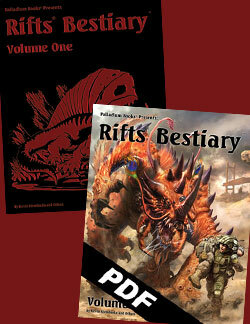 A few choice new monsters to whet your appetite for the Rifts® Bestiary, Volumes One and Two, and the books to follow. "Official" source material. Nightbane® – Age Modifiers and Education Rules – by Mark Oberle. Tables and stats for determining an occupation and skills based on the age of the character. Plus more insight to being a Nightbane and a few new skills. "Official" source material. More notorious Rifts® monsters and animals, old and new, everything updated and expanded. 192-224 pages each volume – $26.99 retail – Cat. No. 897 (Volume Two). In production. "People will tell you no one can survive in the big cities. They are wrong." – Brad Ashley, Leader of the Road Reapers in the Zombie Apocalypse. 96-128 pages – $17.99 retail – Cat. No. 237. Final page count and price yet to be determined, but probably 96 pages – $17.99 retail – Cat. No. 475. 42 occupations for "ordinary" people. Savage Rifts® Voice of Hope Podcast: An in-character world building podcast for Rifts® and Rifts® Savage Worlds® intended to provide players and Game Masters with world background, adventure hooks, and NPCs. All of which are excellent resources. And don't miss the interview with Sean Masters (the host), Cameron Cleveland (G.M. and mastermind behind the Rifts® Living Campaign Club), Sean Patrick Fannon (writer and game designer, Rifts® Savage Worlds, etc. ), and Kevin Siembieda at the end of Episode 19 (it's time stamped). You can check it out for yourself at https://voiceofhopepodcast.podbean.com and on itunes. If you are doing a Palladium fan-based website, podcasts, YouTube programming, etc., please let us know so we can take a look at what you are doing and so we can give you a shout out. We do not have the staff and resources to do everything we want to do, so we appreciate the fan sites that feature Palladium Books' games and settings and promote the RPG hobby. Awesome. We are happy to support you when we can. The Rifter® #83 – source material for Rifts®, Heroes Unlimited, etc. Copyright 2019 Palladium Books Inc. All rights reserved.